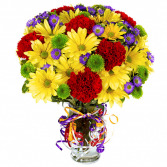 You can send flowers from FORT WORTH FLORIST to any hospital or care facility listed below. Please refer to this list for the names, addresses and phone numbers. Letting someone know you're thinking about them when they're sick or feeling down can make such a difference. 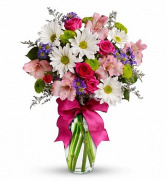 Send your friends or loved one get well flowers to lift their spirits. 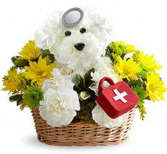 At our Fort Worth florist, we have everything you need to send your best get well wishes. Fort Worth Hospitals and Health Care Providers in Our Delivery Area: All Saints Episcopal Hospital, American Retirement Corp, Autumn Memories, Autumn Years Lodge Inc, Barton House, Bellaire Surgery Ctr, Bethesda Gardens At Fort Worth, Broadway Plaza Healthcare Ctr, Brookwoods Care Ctr, Care-A-Lot Inn, Casa Inc, Cathedral Rock Corp, Cenikor Foundation, Cityview Care Ctr, Clarity Chair, Complete Care Camp Bowie, Cook Children's Medical Ctr, Courtyards At River Park, Covenant Care Hospice And Palliative Care, Covenant Group, Deaf Inc, Eraser Clinic Laser Tattoo Removal, Excel Center Of Fort Worth, Fairview Retirement Community, Fireside Lodge Healthcare Ctr, Forest Hill Nursing Ctr, Fort Worth Nursing & Rehab Ctr, Fossil Ridge Family Dentistry, Fountain Of Hulen, Garden Terrace Alzheimer's Ctr, Garden's Care Ctr, Golden Years Adult Care Home, Grace Ponds Care Ctr, Grand Court Fort Worth, Greenbriar Mansion-City View, Harris Continued Care Hospital, Harris Methodist Fort Worth, Harris Methodist Southwest, Health Care Of Texas Inc, Health South Cityview Rehab, Health South Diagnostic Ctr, Healthsouth Rehabilitation Ctr, Heritage Estates, Heritage Square, Heritage St Joseph Gardens, Huguley Occupational Medicine, Hunter Plaza Apartments, Ihs Fort Worth, Immanuel's Nursing Ctr, James L West Presbyterian Spec, John Peter Smith Hospital, Kent's Nursing Ctr, Kirby Plastic Surgery, Lake Lodge Care Ctr, Lake Worth Counseling, Lake Worth Nursing Home, Lake Worth Village, Lakewood Village, Life Care Hospital-Fort Worth, Mariner Health, Mollie & Max Barnett Apts, North Park Manor, North Tarrant Oral & Maxillofacial Surgery, Oak Park Retirement Ctr, One-Day Surgery Ctr, Orthopedic Surgery Pavillion, Osteopathic Medical Ctr Of TX, Our Sweet Home, Palm House Retirement Apt, Park View Care Ctr, Partial Hospitalization Prgrm, Plaza Day Surgery, Plaza Medical Ctr-Fort Worth, Renaissance Park Multicare Ctr, Richland Hills Nursing & Rehab, Salvation Army Friendship Hse, Shady Oaks Manor Apartments, Silverstone Retirement Cmmnty, Southwest Nursing & Rehab, St Joseph Gardens, Stonegate Nursing Ctr, Sunset Garden, Tandy Village, Tanglewood Oaks Guest Home, Tarrant County B'nai B'rith, Texas Health Resources/alliance, Town Village Ridgmar, Trinity Courtyard, Trinity Terrace, Universal Surgery Ctr, Us Veterans Outpatient Clinic, Vega Place Apartments, Vencor Hospital Forth Worth SW, Villa Hermosa Health Care Ctr, Village Creek Convalesent Ctr, Villas By The Lake, W H Grove Home, Waterford At Fort Worth, Watson Memorial Nursing Home, Wedgewood Nursing Home, Wellington Oaks, West Side Campus Of Care, Westchester Plaza, Westhaven Nursing Home, White Settlement Nursing Ctr, Alterra Clare Bridge, Arkansas House, Arlington Medical Ctr, Arlington Memorial Hospital, Arlington Memorial South Med, Arlington Plaza, Barbee House, Broadway Plaza At Pecan Park, Catholic Charities Diocese, Community Assisted Living, Complete Care Svc Of Texas, Dalworth Nursing & Rehab Ctr, Eastern Star Hospital, Eden Terrace Of Arlington, Elmcroft Of Arlington, Fox Run Estates, Green Oaks Behavioral, Healthsouth Arlington Day Srgy, Healthsouth Rehabilitation Ctr, Heritage Oaks, Hill House, Kindred Hospital- Tarrant County, Mariner Health Of Arlington, Meadow View Assisted Living, Millwood Hospital, Premier Family Dentistry - Arlington, Texas Masonic Retirement Ctr, Town Hall Estates, Town Village Arlington, Vencor-Arlington TX, Villa Residential Care Homes, Waterford Place, Covenant Place Of Burelson, Huguley Nursing Ctr, Huguley Place Retirement Comm, Silver Haven Health & Rehab, Texas Oral Surgery Specialists, St Francis Village, Atria Communities Inc, Baylor Medical Ctr, Baylor Medical Ctr Homecare, Brookhollow Manor Nursing Ctr, Charter Grapevine Behavioral, Ethicus Hospital Grapevine, All Saints-Bishop Davies Ctr, Mid Cities Dental, Southwest Surgical Hospital, Spring Season Of Hurst, Sunny Ridge Retirement Cmmnty, Surgical & Diagnostic Ctr, Whitley Place Assisted Living, Alterra Sterling House, Mansfield General Hospital, Mansfield Nursing Ctr, Methodist Mansfield Medical Center and Harris Methodist Southlake.